During the mid-20th century, the Erie County Fair in Hamburg, New York, began a journey that transformed a traditional, agriculturally based fair into the largest independent county fair and exposition in the United States. As the number of fair days and exhibits expanded, so did the number of fairgoers, increasing gate attendance figures to over one million visitors annually. While fair traditions have provided continuity over the decades, the fair continues to evolve and renew itself through improvements to the fairgrounds, the addition of unique attractions, and an ongoing commitment to agriculture. Erie County Fair showcases the many dramatic changes that have taken place during the modern era of this fair. From the thrills of the midway and entertainment to nationally recognized agricultural, creative arts, and livestock competitions, the fair's history comes alive through color photographs from the archives of the Erie County Agricultural Society. Martin Biniasz is manager of special events and community outreach for the Erie County Agricultural Society, a private nonprofit membership organization that produces the fair. 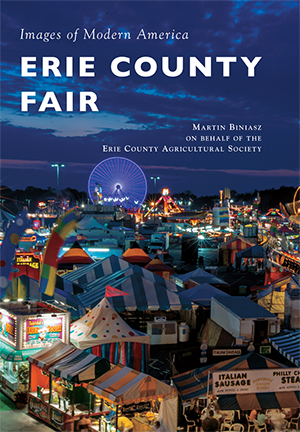 Biniasz has authored a previous book on the subject for Arcadia and is a sought-after speaker on the history of Buffalo, New York, and the Erie County Fair.